What’s inside that Prince Albert Can? When Granny tucked things into a Prince Albert tobacco can, I’m sure she didn’t think I’d look in that tin can 76 years later and find gifts. But I did. The four-inch tall, flat can is wrapped in thick grocery bag brown paper and penciled on the paper is Property Ett Rich Sept 25 -1941. I chuckle when I read Ett. Named Juda Etta Rich, her friends called her Ett, but she signed Etta Rich on checks. I never knew she referred to herself as Ett. The red on the front and back of the can is worn off, imprinted on the backside of the brown paper wrapper. The can’s top and bottom are rusty. As I carefully force the lid open, I see fabric. A woman’s silk handkerchief, wadded into a ball, with black embroidered edges. The fabric so delicate, I fear I’ll tear it. It’s like others that Granny carried – stuffed in her bosom or sometimes she knotted a few coins tightly in the handkerchief corner and then stuck it in her apron pocket. And a small, crocheted bag. Only about three inches across the bottom, a semi-circle shape with a one-inch handle. Surely it was white or cream colored at one time; not the dingy beige it is now. Was this someone’s change purse? Who made these treasures? Not Granny. She quilted, but never held a crochet hook. Maybe her mother, Elizabeth Huddleston Rich who died in 1921? Or one of Granny’s two sisters? Tucked in the bottom of the can is a folded paper. Using tweezers I ease it out. A 5” x 8” blue-lined tan school paper. It’s a letter penciled in cursive in the traditional friendly letter format: heading, greeting, body, closing, and signature. Granny’s sister, Mary, signed it. This family document is headed with Caddo, Oklahoma, dated June 28, 1922, and addressed Dear Sir. With no corrections, the one sentence body of the letter reads as follows: Please permit Ett Rich to take my part of Father Bank account To Pay expencies. Signed: Yours Truly, Mrs. Mary Pierce. 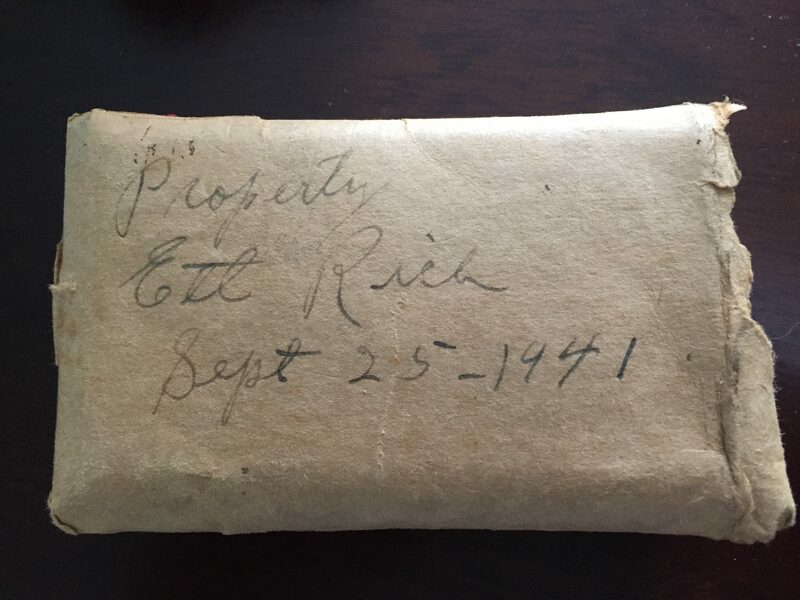 As I hold this crinkled old paper, I can see Granny at Pickett County Bank in Byrdstown, Tennessee, as she signed forms to transfer her father’s money from her sister’s name to hers. David Rich died March 1922, just months after his wife’s death. Granny and her sister Dona lived in Byrdstown; Mary and her husband had moved west. So Granny was the executor of her father’s estate. I knew she continued to live on the family farm, the home place, for a many years. Where did Granny keep this document for almost twenty years before she stored it in the Prince Albert can? Why were that handkerchief and small bag inside? I have to think Granny valued these items as family keepsakes. And reading the letter and handling the crocheted bag and handkerchief connects me with great-grandparents and a great aunt I never knew. Thank you for this gift, Granny.